Officials with the FBI's Chicago field office said they had no problem with Kifah Mustapha, an Illinois imam who was named as an unindicted coconspirator by federal prosecutors in a 2008 terror trial, participating in a Bureau Citizens' Academy and touring the secret National Counterterrorism Center. FBI spokesman Ross Rice said Mustapha has never been convicted of a crime or charged with a crime. "If we thought he was a security risk, we wouldn't have included him," Rice told Bill Gertz of the Washington Times. It seems the Chicago Bureau didn't look very hard. An Investigative Project on Terrorism investigation has found that Mustapha, an imam at the Mosque Foundation in Bridgeview, Ill., has an extensive history of raising money for groups tied to Hamas, the Islamist terror organization designated by the US government. That particularly includes the Council on American-Islamic Relations (CAIR), the group for which Mustapha has raised hundreds of thousands of dollars. The FBI severed its relationship with CAIR in mid-2008 because of concerns surrounding the group's connections with Hamas. Mustapha misrepresented his leadership role in the Islamic Association for Palestine, Hamas' U.S. propaganda arm, while testifying under oath during a 2004 deposition, according to court records and IAP documents. Mustapha raised more than $100,000 for CAIR and another group closely tied to the radical Muslim Brotherhood – the Muslim American Society (MAS) – as recently as August 2010. He also appeared at an April 2010 CAIR fundraiser and raised more than $240,000. As a member of the band al-Sakhra, Mustapha performed at fundraisers for the Holy Land Foundation for Relief and Development, which the federal government shut down in 2001 because of its ties to Hamas. In addition, Mustapha spent at least four years as a paid HLF fundraiser and was named as an unindicted conspirator in the 2008 HLF. It ended with the conviction of five foundation officials on charges they funneled millions of dollars to Hamas. 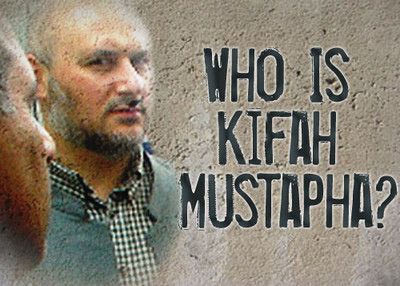 Mustapha was shown in a video exhibit in the 2008 HLF trial singing "O Mother, Hamas for jihad," and calling for resisting Israel with a "machine gun and a rifle." He hosted a fundraiser in July 2009 for Viva Palestina, a British charity that raises money for the Hamas-run government in Gaza. Mustapha appeared at the Mosque Foundation with George Galloway, the former British Member of Parliament and Viva Palestina leader. IPT first reported on Mustapha in January, after it was learned the Illinois State Police had invited him to be a Muslim chaplain. The revelations in the first IPT report, particularly that Mustapha was an unindicted coconspirator in the 2008 HLF trial, led the Illinois police to rescind their offer. Mustapha sued the police in August, claiming they had violated his 1st and 14th Amendment rights. Mustapha gave his 2004 deposition in the case of Boim vs. Quranic Literacy Institute, which was brought by the parents of 17-year-old American David Boim, who was killed in a Hamas terrorist attack in the West Bank, against the Holy Land Foundation and related groups. A federal appeals court in December 2008 upheld the $156 million verdict against the groups named in the suit. Court documents show that Mustapha worked for the Holy Land Foundation from 1996 to 2000 and helped raise more than $300,000 for the group. The IAP and HLF were identified by the U.S. government as two arms of the Palestine Committee, a Hamas support network created by the Muslim Brotherhood. When asked by attorney David Oppenheim if he was a member of the IAP board, Mustapha said: "You know, there's all types of boards. We were a group of volunteers and we were a committee. I'm not sure if they included that in any of the board, but I did not register to be a board member as far as I remember." Instead, Mustapha said, he was more of a volunteer for IAP. But the program for the 2000 IAP convention in Chicago that Mustapha helped direct shows that he was a member of the "board of directors of the Islamic Association for Palestine." He was listed twice on that page of the program, once as a board member, and again as the convention's program director. The 2000 IAP program contains congratulatory letters from the leaders of a variety of Islamist groups, including other members of Hamas' Palestine Committee, including the United Associated for Studies and Research (UASR), an Illinois-based group named along with CAIR as part of the Palestine Committee during a 2007 trial of the five HLF officials. In this exhibit, a 1994 agenda for a Palestine Committee meeting, CAIR, the IAP, HLF and the UASR are listed among organizations for the committee to develop. According to the committee's amended bylaws from 1991, the committee was created to raise money for Hamas. The program also featured letters from the head of the Global Relief Foundation, an Islamic charity shut down by the U.S. government in 2002 because of its support of terrorist organizations, and the American Muslim Council (AMC). The founder of AMC, Abdurahman Alamoudi, pleaded guilty in 2004 to taking money from Libya for a plot to kill then-Crown Prince Abdullah of Saudi Arabia. Alamoudi is now serving a 23-year federal prison sentence. Mustapha's fundraising activities were detailed during the Holy Land trial. Mustapha was named as an unindicted coconspirator because he was a member of the Palestine Committee or an affiliated organization and because he worked for Holy Land as a fundraiser. He continues to raise money for CAIR and MAS, according to an interview in August with the website Onislam.net. "According to Sheikh Kifah Mustapha, Imam and assistant director of the mosque, these contributions were collected 'to support the projects of Islamic organizations operating on the American scene, such as the Council for American Islamic Relations (CAIR) the Muslim American Society (MAS) and … charity organizations which have activities inside and outside the United States like Islamic Relief, besides supporting many mosques and Islamic schools spread throughout all the United States,'" the website reported. 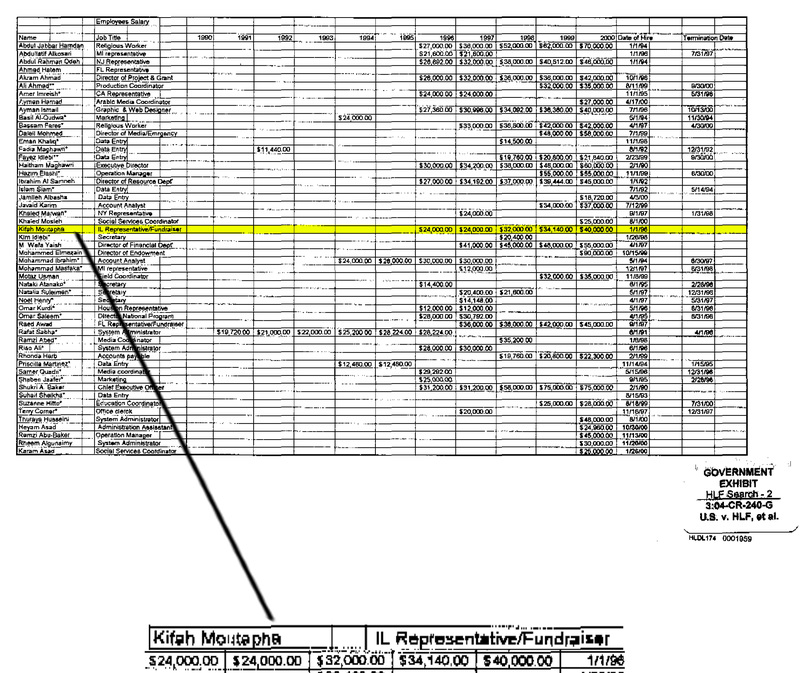 CAIR was also named as an unindicted coconspirator in the 2008 Holy Land Foundation trial. The U.S. government designated Hamas a terrorist organization in 1995. MAS, whose leaders include convicted felon Mahdi Bray, was founded in 1993 to give the Brotherhood more prominence in the United States, records show. The Citizens' Academy to which Mustapha was accepted is a six-week program that takes place at various FBI field offices and at the Bureau's Quantico, Va., facility. FBI rules say a participant must either be nominated by a Bureau employee or recommended by a previous graduate. Attendees, the FBI website says, "must be at least 21 years old (with no prior felony convictions) and must live and work in the area covered by the field office sponsoring the academy." As part of the program, Mustapha was also part of a 30-person group that toured the FBI headquarters in Washington and the National Counterterrorism Center. Mustapha's participation was reported last month by Chicago's WLS-TV. An Oct. 29, 2009, article posted on the FBI's site says the Academy was created in the mid-1990s and is aimed at reaching out to various communities to help the Bureau do a better job. FBI Director Robert Mueller was asked about Mustapha's participation in the program during a conference Wednesday. He did not address Mustapha specifically, but said "we look at the backgrounds of individuals who participate in the Citizens' Academies." According to the Washington Times, Mueller noted that the six-week programs are separate from "the investigations that we may be handling." NOTE: For more details on Mustapha, see IPT's expanded dossier here.